John Martin, a Bangor accountant and shopkeeper, especially wanted several things from life: to be respected and respectable and for his children and heirs to learn about -- and learn from -- his times and experiences. To achieve the latter part of that goal, Martin (1823-1904) began in 1864, to compile a series of reminiscences and observations about his parents, his childhood, his, work, the places he lived, his political views, his passions -- all intended for his wife, Clara Cary Martin, and their children. Martin wrote, "I have been very minute in representing every particular for her (Clara) & my children so that whereever this Book may be an idea can be given at once of localities and distances although the outlines are entirely from memory and not made by any given scale of feet." Martin achieved respectability in that he apparently was viewed as honest, hardworking, and a good citizen. Economic success was more elusive, a disappointment for Martin and, perhaps, one of the lessons he intended for his children. Martin left behind a 650-page Journal and the three scrapbooks that contain his commentary on the past as well as newspaper clippings and other printed material. He refers to notes and sketches that helped inform his surviving volumes. The Journal that he began writing in 1864, and the scrapbooks he wrote between 1864 and 1889 afford a remarkable record of Bangor, Hampden, Ellsworth, and nearby areas from the 1820s until the 1890s. He called the Journal his "history" and while he provided some later updates, it largely refers to past events he recalled while writing it. 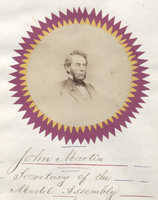 The scrapbooks contain more contemporary content, including discussions of politics, the Civil War and its aftermath, and changes in society and fashion. The fifth volume is an account of one of his particular passions: dancing, and especially of the Dancing Fraternity of Bangor. Compiling scrapbooks of newspaper and magazine illustrations and clippings and other printed materials was a popular activity starting in the mid nineteenth century. Ellen Gruber Garvey wrote in her book Writing with Scissors that scrapbook creators were presenting their own versions of events by choosing which articles to clip and how to present them. Martin went a step further, adding his own commentary -- often at length -- to the clippings. Some are presented as part of larger stories he told or as a way to provide additional detail. In one instance, he pasted into the scrapbook a story about a list of resolutions by a political party, then wrote, "Being that this is my own Book I take the libberty to pass a resolve on my own account." Martin rarely left it to the reader to guess what his views were, probably because he saw the Journal and Scrapbooks as lessons for his children. Not only did he describe things minutely – his house, various buildings, interiors of businesses and schools, gardens, neighborhoods, his inventions, fashions, his children, his interest in dance, and his friends, including those who went to California during the Gold Rush – he illustrated many of his surroundings in amazingly detailed folk art-style sketches, many enhanced by watercolors. The illustrations and his meticulous descriptions of them provide an unparalleled record of architecture, businesses, gardens, schools, churches, and various events -- all offered by a non-elite man who has been largely ignored by history. Martin's father, John Martin Sr., a native of Cromwell, England, who worked as a tailor in Ellsworth, died when his only child was 11 months old. Because John Martin did not know much about his father, he wanted to insure that his children had considerable information about him and his life, including the struggles he faced and the changes in society -- some of which he liked and some of which he abhorred. Martin's mother, Anna Stratton, lost her parents when she was young. Dr. Moses Adams of Ellsworth and his wife, Mary, took her in and educated her along with their children. Anna Stratton was an excellent student and progressed well beyond the basics. But that family security did not last, either. Adams was charged with brutally murdering his wife on May 12, 1815. Acquitted for lack of physical evidence, he was nonetheless considered guilty by many. That ended Anna Stratton's support and prospects of a financially secure life. She became a teacher, a job she held until she met and married John Martin in 1822. Martin Sr. died in 1824, leaving his wife and young son, also named John, with little financial security. The house the couple had bought was taken away.